This article contains facts and information about the life and times of the famous Native American Indian chief known as Powhatan, aka Wahunsonacock. Who was Powhatan and why was this Native Indian chief famous? 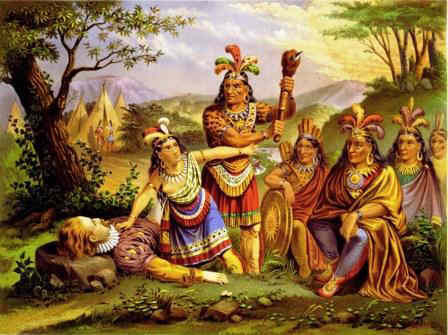 Summary: The Powhatan Confederacy was founded in 1580 by Wahunsonacock who became commonly known as Powhatan. He was the father of Pocahontas who famously saved Captain John Smith. He was a leader during the Powhatan Wars (1609 - 1646) that were fought during the early colonization period between the English settlers of the Virginia Colony and the Algonquian-speaking tribes in the Powhatan Confederacy. The following fact sheet contains interesting facts, background history and information about the life of Powhatan, aka Wahunsonacock, and the events in history that led to his fame as a great Native American Indian leader and founder of the Powhatan Confederacy in 1580, which consisted of 30 tribes. "Why should you take by force that from us that which you can have by Love? Why should you destroy us, who have provided you with food? What can you get by war?" Discover the vast selection of pictures on the subject of the tribes of Famous Native Americans such as Powhatan. The pictures show the clothing, War Paint, weapons and decorations of various Native Indian tribesthat can be used as a really useful educational resource for kids and children of all ages studying famous Native Americans. We hope you enjoy watching the video - just click and play - a great educational resource for kids.